I had my first date with my fiancé. We had met on a New York subway platform (more here) around the 2nd of Feb. and we then talked briefly on the phone and on email to solidify out first date plans. Then, on the day that our brunch was scheduled, NYC had the worst snow storm in the city's history, leaving behind 26.9 inches of snow. I was not looking forward to venturing out in that mess and neither did he for when he called to confirm, we were both wavering and decided to make our first date the following night, the day before Valentine's Day. It's funny, going through my blog archives I see I blogged about the storm and casually mentioned how I had to cancel brunch plans, who knew I was talking about my future husband in that little line. We also talked for an hour on the phone. I learned more about him from that little phone call than I had from other guys on past dates. I discovered he lost his mother the same year I lost my father, which is rare in itself, never mind the same year and in our age range. We also found we had other things in common and I was starting to really look forward to our date, anxious even. Being the considerate guy that he is, he picked a place near me, a place I hadn't been to--Tio Pepes and after dinner we checked out a nearby bar called Fat Cats where we played foosball and pool, which was fun (I always think a first date is better when it includes an activity, walking in the park, going to the zoo, mini golf, etc., less pressure that way). He even walked me to my door in all the snowy city slush and I was getting giddy for the eventual goodnight kiss. On my front steps we kissed and he then joked that I better be going to my grandmother's home for Valentine's the next day, since I had told him that was my plan for the holiday, but he seemed skeptical. I thought that was cute. Tonight we are headed to a restaurant I've wanted to try since I moved to L.A., Geisha House. 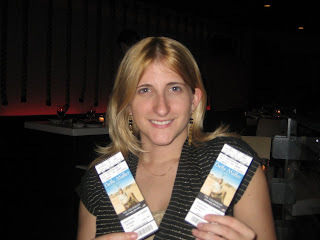 As an anniversary gift, I received tickets to Bette Midler's Vegas show in July! Yay! I'm so excited, I last saw her in concert back when I was 12 and her singing of "From a Distance" was so amazing it shook me and brought tears to my eyes. I can't wait. thats cute. even aw worthy. That is such a cute story!! I can't believe you met on a subway platform...that is so cool. Congrats on the two year anniversary of your first date! awww...what a sweet story. Nothing beats a good "how we met" story. Have fun at Geisha House - I've never been myself, but I hear it's good. Aw =) This post totally made me smile. What a great story! Happy anniversary! P.S. I've actually read your blog for awhile, and I love it. I just haven't commented until now. Happy Anniverary and Valentines Day!